Posted in: St. Louis Cardinals. Tagged: Cardinal, Chris Duncan, Jake Westbrook, John Mozeliak, Wacha. My read from mo was wacha will go back down to work on the curve, maybe turn it into a short slider. John Mozeliak joined the guys in the booth at FSM in tonight’s game and talked a lot about Wacha. It was clear that he still liked Wacha’s change-up but was disappointed in his fastball command. He also made a point in saying that he really wants him to develop a quality 3rd pitch in his curve. In fact he even said that he would rather have him be developing that in AAA rather than dealing with the stress of the big leagues. Pretty telling stuff from the guy in charge. Now I like Chris Duncan a lot but he was just venting his thoughts on Twitter. He in no way has any knowledge of what the organization is going to do when Jake Westbrook comes back to the rotation on Friday. But the hints were certainly prevalent and I agree with Duncan’s observations. All in all if Wacha gets sent down I’m fine with that. Injuries forced the Cardinal’s hand this season but I would have preferred to have Wacha come up and stay up. Until this weekend… Go Cards! Posted in: St. Louis Cardinals. Tagged: Boggs, John Mozeliak, Mike Matheny, Mitchell Boggs, Springfield Cardinals, St. Louis Cardinals. St. Louis Cardinals GM John Mozeliak stepped up to the plate and took charge over this fiasco sending Boggs to AAA Memphis. He imposed his absolute power over this organization. When La Russa retired, this became his team. He started with promoting his special assistant to manager, Mike Matheny. Now Mozeliak looms large over the situation. Matheny’s infatuation with Boggs this year is the only real negative to this season behind injuries. So now what? Boggs is in the deepest abyss you can be with this organization and fan base. I DO feel sorry for him, but at this level it seems there is a lot of turn over year to year. Boggs has most likely pitched his best season. So… Keith Butler anyone? 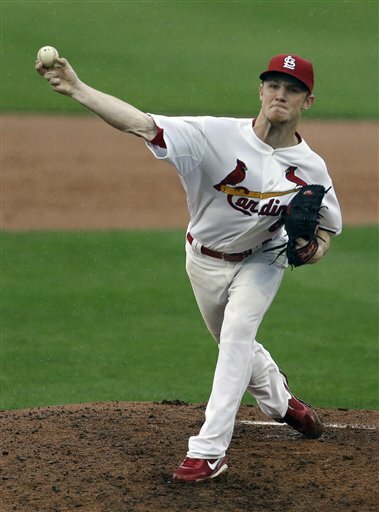 Former closer of the Springfield Cardinals, he’s an undersized guy with decent velocity. He isn’t the typical hard thrower you see so often in the Card’s farm. He’s pitched magnificently at AA, posting a 0.66 ERA with 21 K’s in 13.2 innings. But… that’s at AA. The Cardinals tried him in Memphis this season and he struggled giving up 6 ER in 5 innings while walking 4. Small sample size but the Cardinals had seen enough and sent him down. Now he’s here in St. Louis. Why? He was already on the 40 man roster and it was the most convenient option. I wish everyone stayed safe in OKC and the St. Louis area last night as tornadoes ripped through those areas.